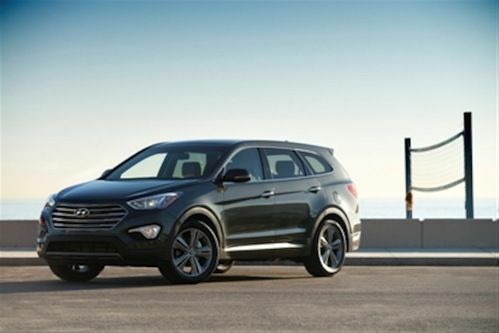 As Hyundai announces pricing for their new six/seven-passenger 2013 Santa Fe, they plan to do it in a big way during the Super Bowl. The new SUV will be the most valuable player in the big game on Sunday, starring in three of the five Hyundai Super Bowl day ads. The Santa Fe will be in the “Epic Playdate” ad, Hyundai’s musical collaboration with legendary alternative rock band, The Flaming Lips. With attractive pricing announced by Hyundai, the new crossover will be the most affordable seven-passenger crossover on the market. Hyundai has announced pricing for the new six/seven-passenger Santa Fe, starting at $28,350 for the extraordinarily well-equipped Santa Fe GLS FWD. The Santa Fe GLS with AWD will start at $30,100. The range topping Santa Fe Limited with FWD comes in at $33,100. The 2013 Santa Fe Limited with AWD will start at $34,850. Pricing is excluding $845 freight charges. At $28,350, consumers will discover the three-row standard seven-passenger Santa Fe is the most affordable seven-passenger crossover on the market. It’s priced below Ford Explorer, Nissan Pathfinder, Toyota Highlander and Honda Pilot. The new 2013 Santa Fe offers more standard features than the outgoing Varacruz at the same price point. Hyundai is launching the 2013 Santa Fe in a five-passenger model, similar to the previous generation version, and a longer wheelbase seven-passenger, three row model. The all-new third-generation Santa Fe has been completely redesigned and weighs in 266 pounds lighter than the outgoing model. The new Santa Fe comes loaded with standard features like a six-speed automatic transmission, rear seat HVAC vents, remote keyless entry, Bluetooth with Voice Recognition, panoramic sunroof, heated rear seats and heated steering wheel, power liftgate and a trailer package with 5000 lbs. towing capacity. The new 2013 Santa Fe will offer a number of optional packages for buyers to choose from. The 2013 Santa Fe lineup will feature three engine choices. The Santa Fe Sport will have two powerplant choices. A 2.4-liter Gas Direct Injection engine that produces 190 horsepower and 181 lb. ft. of torque. The highly efficient engine will get an EPA estimated highway fuel economy rating of 33 mpg with the front-drive and automatic gearbox. Hyundai can boast the highest highway fuel-economy of any SUV equipped with an automatic. The Santa Fe Sport will also feature a high-output 2.0-liter turbocharged direct injection four cylinder. The twin-scrolled turbocharged four will produce 264 horsepower and 269 lb. ft. of torque. The 2.0-liter will get an EPA estimated 31 mpg with front-wheel-drive and automatic transmission. The additional torque should result in excellent pulling power for carrying extra cargo or for pulling uphill. The long-wheel base 2013 Santa Fe will feature a 3.3-liter direct injected V6 powerplant that will produce 290 horsepower and 252 lb.ft. of torque. Estimated fuel mileage will be 19/city and 26/highway. The LWB Santa Fe is the only midsize CUV with a standard direct injection V6 engine. The 2013 LWB Santa Fe will offer 146.6 cu. ft. of passenger volume compared with 108 cu. ft. for the standard wheel base model. It will also offer 16.7 more total interior volume. The LWB three-row Santa Fe increases second-row legroom by 1.9 inches and cargo capacity 5.6 cubic feet. It also features a standard 50:50 split folding third-row bench seat with 31.5 inches of legroom. Customers can visit the Hyundai website to view videos and learn more about Santa Fe, including features, options, safety and performance. The website also offers customers the option to build and price their own Santa Fe. Look for the new 2013 Santa Fe six/seven passenger crossover to be the star of the Super Bowl with three big ads. The new Santa Fe is set to arrive in Hyundai showrooms by the end of February.